Their eyes were originally black - but since I found them somewhat disturbing, I painted them white. Why should the universe be limited to humans? With billions of galaxies out there, the idea that we are the only ones in creation seems to me self-centered idiocy! It makes no sense, especially when you consider that for the past six thousand years – all of written history – we wonderful human beings have not be able to stop conquering, torturing and killing each other for a New-York- minute. There is simply no reason why the existence of other beings in our galaxy or beyond should destroy our faith in God. If anything, the expansion of creation to the far reaches of the stars on the contrary might amaze and delight us with new wonder. We don’t necessarily have to shoot to kill anything or anyone that doesn’t look like us or perhaps has a different belief system – although this has been our ongoing behavior with each other. Every painter meditates in one form or another, whether they are conscious of it or not. When you spend long hours in front of a blank white page or canvas, you are forced to control your wild-horse thoughts. I began to paint from the time I was 3 years old. Perhaps this is why I have been able to see so many UFOs or perhaps my experiences have something to do with the paintings I did many years ago (1961-2) back in high school. I believe that my years of practicing meditation opened me up to being able to “See”. You may be wondering – What does meditation have to do with UFO sightings? *Researchers like the recently deceased John Mack and many others who have spent years with abductees have discovered this: The ‘good’ - meaning spiritually evolved - ETs teach the abductees perennial wisdom very similar to certain doctrines found in eastern metaphysics, Hindu, Sufi and Buddhist. *Anyone who meditates for long periods of time or for many years begins to ‘see’ things in the eye-of-the-mind, which in eastern thought is also called the Third Eye. These wonderful visions instruct and confirm our spiritual aspirations. I believe the existence of the Third Eye, when it is opened, is why some people see these entities and their ships while others do not. My understanding is that in the previous cycle of time, before the advent of the Kali Yuga, we all had these abilities – meaning we all had access to so-called Invisible Realms, the ‘Lokas’ in Hinduism and the Buddhist Myriad Worlds. We all were ‘telepathic’ and therefore we could all communicate mind-to-mind; which would make lying impossible and writing unnecessary. Even today, the Australian aborigines are reputed to be able to communicate over great distances with each other. Far from evolving, I feel that modern man is but a fallen, even dysfunctional version of what he once was in another, say Golden era. What we call ‘material progress’ and the consumer mentality we worship, is poisoning the planet and creating an unsustainable environment. Some of the ETs are here to tell us just that. The others, who are definitely not compassionate beings, seem to be here for our DNA and whatever is useful to them. 1. 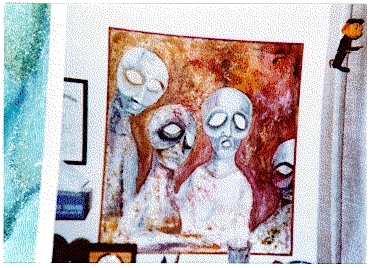 In high school, I painted a series of oil paintings that looked exactly like the Greys, the ETs with the big eyes. Was I abducted? I have no memory of it and no fear. The year was around 1962 and years before Whitley Streiber’s book ‘Communion’ was published. In fact it was only after the publication of that book that I realized what I had painted back then. The weird thing is that these paintings were immensely popular. You would think they would scare people, but nope! People loved them and even stole them. In 1964 I had an art exhibition at Princeton University and 3 of these ET oils were stolen right out of the gallery late at night. 2. 1973: The first up close sighting was in broad daylight up in Mount Shasta, where 1000s of sightings have taken place for years. I was hiking with 3 friends. I wandered off by myself for a minute and looked up to see the classic disc shape, rather pewter in color, hovering right above me. Frankly I was terrified and it seemed to sense my fear and shoot straight up into the blue sky and disappear. I naturally ran to my friends, saying ‘Did you see it?’ --- Nope! Not one of them had seen a thing! 4. 1989: One night I was sleeping next to a large wide window. It was in the country with no one around and I like the night shadows. I opened my eyes and there was a ‘being’ floating outside my window horizontally. He didn’t look like anything I had ever seen, but he wasn’t ugly – just strange, other world-like. I was frozen – meaning I couldn’t move. He communicated to me mind-to-mind and said that he just wanted to show me that I was completely powerless. Was I agraid? Sort of – but also really curious. I never saw him again – that I recall. 5. 1996: I am flying into LAX. I look out the window and there is the weirdest UFO I have ever seen – it looked like that opera house in Australia! It was blue and silver and just sailed right by. Nobody seemed to notice. So I made a joke with myself – I said OK, let’s see another one. In a few minutes another one just like it but blue and gold sailed by. 6. 2003: In the night sky, I saw a disc-shaped UFO fall straight down very fast – as in perpendicular to the ground – and melt. The dark craft was seemingly round, and as it quickly fell, the part nearest to the earth became liquid light, which was pulsating, wiggling, dripping, like bright white fluid mercury in a sort of flexible crescent shape. Then it vanished, vaporized, disappeared. Nothing. I thought - someone must have shot it down because it fell straight down, no angle of trajectory. Later a friend suggested to me that it might have moved into another dimension. Maybe both. These incidents and others have forced me to come to terms with what I saw and to try to understand within the context of my spiritual search. There is no reason why the existence of beings out in the universe should exclude spirituality and our search for meaning. After these numerous sightings, I could never believe that UFOs don’t exist - no matter who tells me! The tragedy of disinformation and denial for so many of us, who have seen with our own eyes, is cruel and damaging - and has had the unfortunate if unintended consequence of making millions of otherwise honest citizens lose faith in the credibility of the government and the media. As Ingo Swann describes them, "...those echelons of conventional credibility that lasciviously get off on deconstructing those unfortunates who experience what they can't prove." We are not alone! Hopefully we are in the process of beginning to accept this and to extend our limited understanding of our relationship with the universe far beyond what we have known in the past. Knowledge is not set in stone – it is fluid and growing, as it should be. The ancients knew about these beings, the so-called extra terrestrials, because the interacted with them. Arrogant as we are here in modern times, we have forgotten what we once knew! Far from evolving, our recent technology is bringing us close to extinction. We need to once again discover our relationship to creation and explore the underlying metaphysical principles that make up the universe. As Swann says, “Earthsiders [he calls us] as a whole seem to be caught up in some kind of strange but broadly shared amnesia induced..."